Perfect for smaller families, Mango is a well-appointed, two-bedroom, two bathroom villa with lots of outdoor space. The living room features a plasma TV on the wall and ample room for everyone. The adjacent dining room looks out over the private garden. A king-size bedroom downstairs features a seating area, private veranda, and en-suite bath with a soaking tub. Upstairs, the master bedroom features a two-person soaking in between the bedroom and the bathroom. Outside a walled garden, provides privacy. Mango comes fully staffed with a gourmet chef, bartender, housekeeper, and concierge. It shares the main pool with Sea Grape & Naseberry. 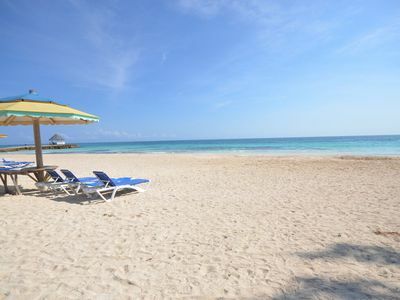 Idle Awhile Villas, Negril, Jamaica - a boutique setting fo 6 individual villas that have beachfront access in Negril! 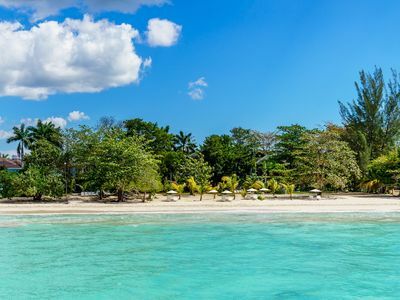 A Luxury Villa Property, set on a swath of Private Beach. 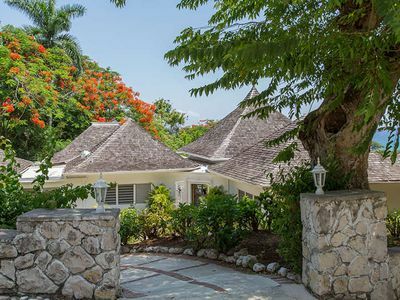 Set on a beautiful stretch of Negril's famed 7-Mile Beach, Idle Awhile Villas is a beautiful villa complex. Six luxurious villa, ranging from one to five bedrooms, are all elegantly appointed, with plenty of space, comfortable furnishings, lush gardens, entertainment centers, incredible art work, private pools, jacuzzi and brilliant views. All villas include a full staff-private chef, bartender and housekeeper, 24-hour security and concierge. 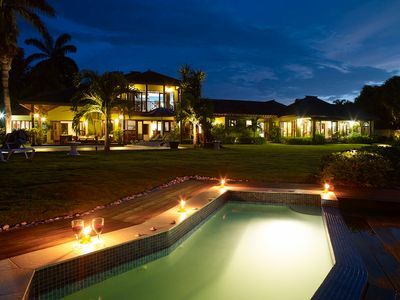 Every villa has air-conditioning, internet access, cable TV and pool access. All our guests have complimentary access to the premier ten acre Sports and Fitness Complex at nearby Couples Swept Away Negril. These incredible villas, with magnificent views and attentive staff, make Idle Awhile Villa a vacation experience not to be missed. Idle Awhile Villa has two meal plans an all-inclusive and an EP. The All-Inclusive plan includes all food and beverages (not including lobster, steak and certain premium liquors). Guest will select from an all-inclusive menu provided and an open house bar. For the European Plan guest can simply choose to go grocery shopping for themselves and the chef prepare the their meals. Another option is our staff may go shopping on their behave; this attracts a 10% service charge on the grocery bill plus taxi fare. Our most intimate villas, a hidden gem surrounded by a tropical paradise. Ideal for couples, honeymooners, anyone looking to rekindle any dying fire. Sea Grape is a 1500 square feet escape. The airy living room features high ceilings, cool tile floors, and luxuriously comfortable furnishings. 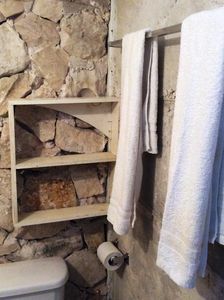 The master bedroom and bathroom opens into each other, its en-suite bath features a Roman soaking tub for two. The 4-poster, king-size bed has a whimsical mosquito netting canopy. The private dining gazebo is encompassed by exotic plants and palm trees, which provide relief from the Jamaican Sun. Sea Grape comes fully staffed with a gourmet chef, bartender, housekeeper and concierge. It shares the main pool with Mango & Naseberry. 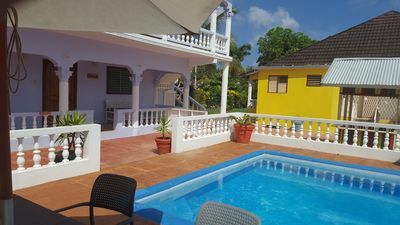 A beautiful three bedroom villa, Naseberry is situated right on the edge of the 7-Mile Beach. The oversized family room has multiple seating areas and a full wet bar. King-size bedroom downstairs and upstairs both have views of the Caribbean, en-suite baths, and separate sitting areas with fold out couch, ideal for children. The master bedroom upstairs has a separate seating area and an immense en-suite bath. The large outdoor verandah of the master- bedroom welcomes guests to enjoy the sunset views, gardens and private jacuzzi. Naseberry comes fully staffed with a gourmet chef, bartender, housekeeper and concierge. It shares the main pool with Sea Grape and Mango. The finest of the Idle Awhile Villas, Almond is a mansion overlooking the water. The living room features high ceilings, breezy floor to ceiling windows, and luxury furnishings. The fully equipped wet bar and full size pool table guarantees fun. An indoor/outdoor dining room can comfortably seat up to 12 and has beautiful views of the water. 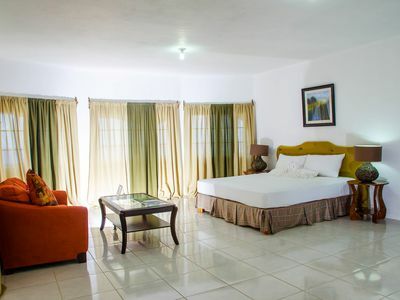 The king-size bedroom downstairs offers an en-suite bath and verandah with beautiful garden views. Upstairs, one king-size bedroom has an immense en-suite bath and veranda with beautiful garden views. The other king-size bedroom features a large en-suite bath and an ocean view verandah. The master bedroom features grand, vaulted ceilings, a writing desk, and seating area. The master bathroom features a Roman soaking tub, while the verandah boasts matchless views of the Caribbean. Outside, guests of Almond enjoy a sun-soaked, private, beach front pool, along with an outdoor living room that is perfect for escaping the heat. The largest villa on the property, Cotton is an opulent escape from everyday life. A 5500 square feet villa, set on the very edge of the beach, with five bedrooms and five and a half baths, Cotton is perfect for families or friends. The spacious living room boasts luxurious comfortable furnishings, a full wet bar and plenty of room to escape the Caribbean sun. An outdoor dining gazebo, with incredible views of Negril's famed sunsets, hosts up to 14. 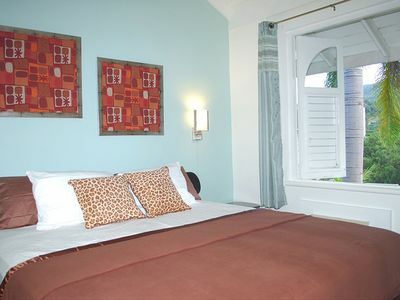 Two king-size bedrooms downstairs each have private baths and verandahs overlooking the gardens and Caribbean. Upstairs, two more king-size bedrooms look out over the grounds. The master bedroom features an immense verandah with direct Caribbean views. Outside the guests will enjoy the private pool and their private swath of beach. Cotton comes fully staffed with a gourmet chef, bartender, housekeeper, and concierge. Palm is 5,000 square feet of beach front luxury. Surrounded by beautiful gardens, Palm offers privacy, comfort and relaxation. The lower level features two king-size bedrooms with en-suite baths and private verandahs, as well as a spacious living room. The living area is impressive, with fully stocked wet bar, entertainment center, and seating for 12. Upstairs, the master bedroom offers a vaulted ceiling, a plush, king-bed; separate seating area, en-suite bath with soaking tub, a private verandah of ocean or garden view verandahs. . The second story features two more king-size bedrooms with en-suite bathroom and ocean or garden view verandahs. Outside, a covered dining pavilion overlooks a private pool. Sea Grape (1 bedroom villa)- $300 plus 10% gov.tax & 10% service charge. 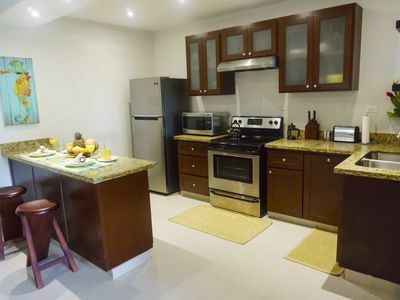 Mango (2 bedroom villa) - $600 plus 10% gov tax & 10% service charge. Naseberry (3 bedroom villa) -$900 plus 10% gov tax & 10% service charge. Almond (4 bedroom villa)- $1,200 plus 10% gov tax & 10% service charge. Cotton (5 bedroom villa) - $1,500 plus 10% gov tax & 10% service charge. Palm (5 bedroom villa) - $1,500 plus 10% gov tax & 10% service charge. Sea Grape (1 bedroom villa)- $400 plus 10% gov tax & 10% service charge. 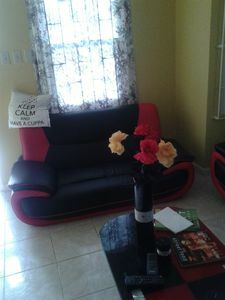 Mango (2 bedroom villa) - $800 plus 10% gov tax & 10% service charge. Naseberry (3 bedroom villa)-$1,200 plus 10% gov tax & 10% service charge. Almond (4 bedroom villa)- $1,600 plus 10% gov tax & 10% service charge. Cotton (5 bedroom villa)- $2,000 plus 10% gov tax & 10% service charge. Palm (5 bedroom villa) - $2,000 plus 10% gov tax & 10% service charge. All rates are based on double occupancy. Children 12 and under stays for free when sharing with adults. For additional person during the Summer, its USD$60 and Winter USD$70 per person plus tax and service charge. The all inclusive food and beverage cost is USD$125 plus 10% tax and 10% service charge for adults and USD$65 plus 10% tax and 10% service charge per person, per day for children between the age of 5 and 12.
o Free access to Couples Swept Away Sports and Fitness Complex (18 and older).